Jerusalem, the capital of Israel, is one of the great cities of the world, and also one with tremendous longevity. According to Jewish tradition the city was founded by Shem and Eber, ancestors of Abraham. King David made it his capital 1,000 years before Christ. Today it is a thriving metropolis, a beacon if you like, in a region full of problems, where countries are torn apart by internal struggles and outside influences resulting in a terrible waste of life and effort. Jerusalem is not without its difficulties, just like any other city, different views often expressed as to the present, and the future. Its population is around 800,000 made up of 600,000 Jews and 200,000 Arabs, many of whom have Israeli citizenship. There is a small minority of Christians too. 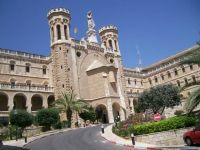 It is more of a cultural icon than Tel Aviv, the commercial capital of Israel. It is a great place to base oneself if visiting Israel, and Jordan too. Border crossing is no problem and you are made welcome on either side. Business Travel News has always been a great promoter of city bus tours, usually open topped, a development of the traditional London double decker. It is a fine way of introducing a new metropolis, normally with an audio guide. This can work out quite expensive if you are a family. 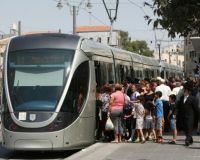 In Jerusalem you can break the rule, and just for around £1 (6.6nis) take a ride on the brand new Light Rail (tram) which takes you past most of the interesting places in the city. It is a ‘jump on – jump off’ arrangement too, the only thing lacking is a downloadable App telling you about the route. Knowing the Israelis that will be available soon too. Take a guide book. Your ticket lasts 90 minutes and must be validated when you get on. Inspectors travel on the trains. 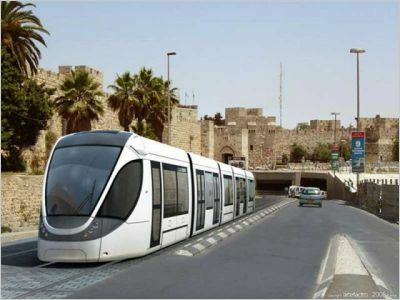 The line, controversial in its development, but now a great success, is 8.6 miles long with 23 stops and runs from Mt Herzl (and the Holocaust Museum – Yad Vashem), to Pisgat Ze'ev a development in the heart of eastern Jerusalem. The section down Jaffa Street, the centre of the city can be very busy, standing room only. The trams are air conditioned and very comfortable with large windows. They are multinational too, Arab mixing with Jew, and tourists. The station names are announced in Hebrew, Arabic and English, further evidence of the municipal authority’s desire to define this tram as a project of unification. I traversed the complete route in one go starting at the Damascus Gate into the Old City. This is in very much East Jerusalem. The whole trip took about 90 minutes. I sat behind the driver and walked the length of the tram at each end of the route in order to be at the front. The northern terminus is at Heyl Ha’avir, a not very inspiring housing development. You can give this a miss and start your return leg by crossing the platform at Ammunition Hill, site of one of the fiercest battles of the Six Day War. Here is the main official memorial symbolising the liberation and reunification of Jerusalem. The fortification is preserved as it was in the war and there is an underground museum that commemorates the soldiers who fell as well as an exhibit displaying the stages of the battle. Southbound your first stop is Shimon Hatzadik station, named for the proximity of the tomb of a High Priest during the time of the Second Temple. This whole area was virtually no man’s land between Israel and Jordan in the period from 1948, when the State was created until the short 1967 war. The Damascus Gate is the Arab entry point into the Old City, and today is a bustling market and shopping area. Much has been achieved by the City Council in rejuvenating a really run down piazza although it is very much more Muslim than Jewish. Safra Square is the next stop and the access point for the Jaffa Gate to the Old City. Opposite the tram stop is a small and pretty park and the municipal offices. Most of the buildings in this area are from Colonial times including the Central Post Office and what was once the Anglo Palestine Bank. The tram will begin to fill up. You are now in Jaffa Street, Jerusalem’s main thoroughfare. There are shops to satisfy all tastes and plenty of eateries too. Davika Plaza is named after the secret weapon of Israel’s War of Independence. Not really very effective, and dangerous for operators, its one virtue was that it was noisy. The enemy ran whenever one was fired. Make sure you get off at the Mahaneh Yehuda Market and take a walk. The land ‘flowing with milk and honey’ really comes into its own, Israel turning the desert into a vegetarian paradise. Fruit and vegetables galore, and Chinese goods of dubious quality! The light railway crosses the ‘Bridge of Strings’ or ‘Chords’ bridge designed by the Spanish architect Calatrava. It is said to be similar to a construction in Seville. When it first was erected in 2008 it puzzled most people. In fact it was designed to incorporate the tram, its only user. Whether it symbolises David’s harp is a subject for discussion, but it is certainly impressive.